Wineries have significant material-handling challenges at every step of the production process. Worse, the specific material-handling tasks vary throughout. In the field, users need rugged-terrain lift trucks that can lift and transport full harvest bins. Then, at the plant, staff needs some way to empty full bins — sometimes loaded with 1,000 pounds of fruit, or more — onto sorting tables. Later, lift trucks must navigate the narrow aisles of the “cave,” while reliably lifting barrels that might hold 30 or 60 gallons of product or more. To lose even a single one of these barrels would represent a serious blow to business; in this instance, barrel-handling fork attachments are crucial. Finally, wineries may need electric counterbalance forklifts, reach trucks, or even pallet jacks carry pallets of full wine bottles for shipment or warehousing. These trucks rarely need attachments, as they’re already optimized for handling pallets. With all these lift trucks everywhere, right-sizing forklift fleets to the needs of the business will keep production and profitability at the highest possible levels. If a single forklift could perform several of these material-handling tasks without changing out fork attachments, then, winery operators could realize significant savings in terms of both cost and staff-hours, which, in the end, amount to the same thing. Here, we consider one solution that can save time and production costs during the trip from vineyard to winery and back again. 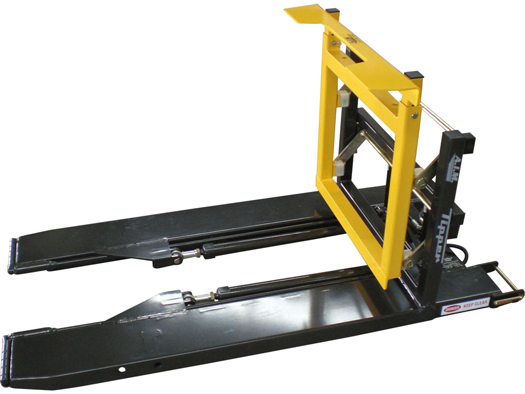 As with any material-handling application, field-to-facility forklift attachments should be optimized for unit loads. In the vineyard, that usually means harvest bins. In fact, we’d go so far as to say that vineyard teams that don’t pick into harvest bins are working much harder than they have to — with associated productivity loss. So, assuming that grape pickers unload into food-safe, vented 20-bushel harvest bins set at the ends of rows, vinery managers can create a traffic pattern for a single rough-terrain forklift that matches the rhythm of workers in the rows. As each harvest bin fills up, then, the forklift picks it up through integrated fork pockets. While lift trucks don’t necessarily need fork attachments to lift and carry loaded harvest bins, wrigging one out with a Forward Bin Tipper will pay dividends at the winery’s receiving room. These unique fork attachments are designed to operate just like bare forks during lifting and travel. At the sorting table, though, the truck with a Forward Bin Tipper can lift and empty full harvest bins without getting out of the seat. Without a Bin Tipper, winery operators are left with two choices, neither of them good. They can ask staff to lift and empty full bins, exposing them to significant risk of musculoskeletal injury. Or else the lift truck can stop, lower its tines, get out of the way, and then wait as a dedicated bin tipper grasps the loaded harvest bin. The first option increases danger. The second leeches productivity. With a Forward Bin Tipper and the right harvest bins, though, operators can retrieve, lift, transport, and empty harvest bins in plenty of time to go pick up the next one. This creates a safer, more productive operation, vintage after vintage.